One of the most beautiful cars ever. The red race car pictured is a Ferrari - a 1962 250 GTO by Scaglietti to be specific. It is red. It is old. It is ludicrously expensive. The estimate by RM Sotheby’s is ranging between 45 to 60 million USD. It will be auctioned off on August 25th in Monterey. None of this matters though. The sale of this Ferrari should be the farthest thing from your mind. I am mostly average man with a mostly average life. I have a wife, two kids, and a mortgage. You know what isn’t in the budget? Any prancing horse. Even a literal horse is unobtainable. I am realistic about my budget and aspirations. If tomorrow I woke up and made it my life’s dream to own a 1962 250 GTO, I would probably never attain that dream. We’re talking wealth here people. Not becoming ‘rich’. Even the fabric for the seats is stupid expensive. Wealth is something that cannot be lost. Anyone who has watched the movie Brewster’s Millions can attest to the fact, it probably isn’t as easy (or funny) to get rid of massive amounts of money. Wealth is difficult to throw away. Being rich is simply comfortable and having the luxury to not work if you live within your means. Rich is easily lost with a bad summer drug habit. If I will probably never be wealthy; why should I care about the sale price of this Ferrari? Will it be interesting to see the big number at the end of the auction? Will it be interesting to know which hedge fund manager wins it, only to hang it on the wall at his castle? Sure. I love trivia. But the sale of this Ferrari means nothing. Whether this Ferrari sells for 45 million or 60 million or even 5 million doesn’t matter. The value of this Ferrari will not affect yours, or mine, or the next guy’s life. We need to focus on the vehicles we CAN afford and not the ones we can’t. I mean lets face it, the Ferrari market has been radioactive with prices spiking for several years. 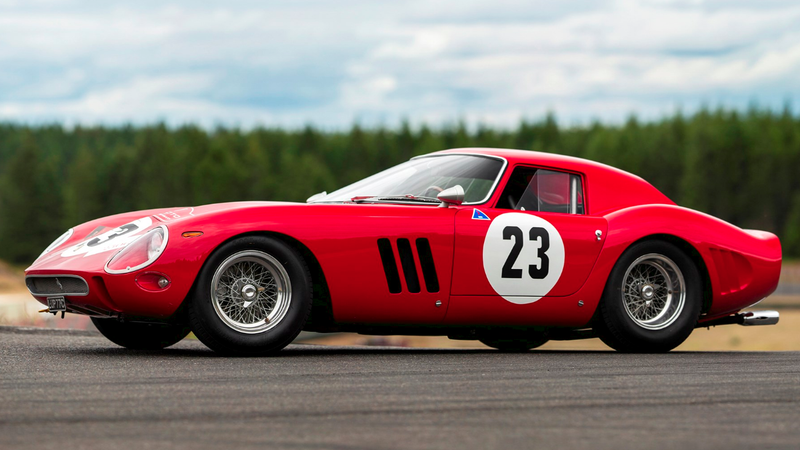 It is bound to come down, but the 250 GTO will always be unobtainable. You can hardly call this the pearl inside the clam. I am more concerned with the price of the Ferrari 308 than just about any other Ferrari. It has historically been one of the cheapest (relative term) Ferrari’s any slightly above average person could afford. I watched a friend sell his 308 for $30,000 and less than five years later it sold again for $60,000. It has only gone up from there, with a price of around $80,000 now. If we were the poor sucker to buy at the wrong time, only to watch 50% of our investment fade away in the breeze, it could be mentally and potentially financially devastating. I’d probably have a nervous breakdown if I lost 50-thousand and then have to do an engine out service to replace some stupid gasket at a cost of another 10-grand. I have a dream - to own a Ferrari once in my life, if only briefly. I will not pay any real attention to the craziness of the top of the Ferrari market. The cars that have always been unobtainable will always be unobtainable. They are the forbidden fruit to be enjoyed by the few with vast amounts of money we cannot even understand. What they do with their limited run vehicles doesn’t matter. We should be worried about the cheaper cars. This is the market that needs to be put in check, and by that I mean a serious correction. Too many people have bought Ferrari’s thinking they’re a solid investment. At some point their investments will need serious work and hopefully you and I can snag them at a deal. A boy can dream can’t he? I can see me now, wide open throttle, no worries as I cruise the back roads in my 308... or 550M... or Testarossa... no wait, maybe a black F430... I can’t decide. It sold for a staggering 48.4 million USD. Cool... and as pretty as this car is, I bet I could spend that money far better. I’d buy a couple vacation homes, every A or B grade collector car I’ve ever wanted (approx. 50 vehicles) and put the rest into the system to pay taxes and live off the interest.